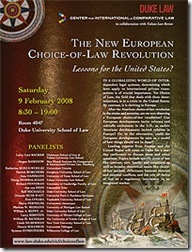 Conference: The new European Choice-of-Law Revolution – Lessons for the United States? In a globalizing world of interdependent legal systems, determining which laws apply to international private transactions is crucial. Choice of Law, the field that deals with these questions, was once so vibrant in the U.S. that we spoke of a veritable choice-of-law-revolution in the sixties and seventies. At that time, Europeans watched, with a mixture of fascination and disdain, these developments at the forefront of scholarship in this field. Now, the pendulum has swung. The field is in a crisis in the United States, unattractive to scholars, and disliked by courts. By contrast, it is thriving in Europe. The most important choice-of-law questions are being addressed wholesale in the European Union. Rules are being unified in Europe-wide codifications, especially two regulations promulgated in 2007 and 2008 dealing with contractual and non-contractual obligations, respectively.The European Court of Justice is rendering important decisions and academics are engaging in active discussions and debates. After the American choice-of-law revolution in the sixties and seventies, are we now observing a new European choice-of-law revolution? Can European developments incite reforms and rekindle excitement in the U.S., as earlier American developments incited reforms in Europe? Alternatively, are European developments a model of how things should not be done? This conference brings together leading scholars from both the United States and Europe to engage in debate and comparative examination of approaches taken in Europe and the United States, with an eye towards renewing interest here in the United States. Methodological issues to be discussed include, federalization of choice of law, choice of law as an instrument of market regulation and methodological approaches. Substantive issues include choice of law in family, tort, contract, and corporate law. There will be ample time for the panelists to field questions and discuss these issues with those attending. Sponsored by Duke University Center for International & Comparative Law in collaboration with the Tulane Law Review. Students are encouraged to attend. More information can be found on the conference website.